I was going to call this the evil pound cake. It's almost impossible to stop eating once you take a bite. I mean, you just can't stop. In fact, when I make this cake, I immediately give it away. I can't have it here. Around me. Ever. It's that good. I'm sure some of you are thinking, "then why even make it, " right? It's hard to explain, unless you are a baker yourself. Baking is relaxing and a definite feel good activity. It satisfies the need for not only the act of baking, but being creative. While the payoff for mixing flour, sugar and eggs together is often just the deliciousness itself, for me its more. It's therapeutic almost; especially helpful on cold, ill-weather days, when I can direct my untapped energy into something constructive. And you always get something at the end. I'm sure I'm not the only one who feels this way. Baking also allows you to get lost in something, leaving you to focus on measuring and mixing, while forgetting about everything else. It's cathartic, brings joy to others...it's a good thing that challenges you. And practice makes perfect...most of the time. I got to use my amazing new tube cake pan. I love it and bought it specifically for testing out this recipe. I tried baking this cake in a and everything oozed out of the bottom. A total mess. Since this cake is baked in an oven that is not pre-heated, I'm thinking that was the problem. It didn't set quickly enough and went out the sides...eeks. In a large bowl, whisk together cake flour, baking powder and salt. Set aside. Add butter and sugar to the bowl of a stand mixer. Cream until light and fluffy, about 5 minutes. Add eggs, one at a time and almond extract. Scrape down the sides of the bowl and mix again for 30 seconds. Add flour mixture in three additions, alternating with milk and ending with flour. Mix until just combined. Do not overmix. Add batter to a one-piece tube pan (16-18 cup capacity) that has been lightly sprayed with cooking spray and dusted with cake flour. Bake in a 325 degree F oven that has NOT been pre-heated. This will give you a loftier cake and a nicer crust. (Do not open the oven door). Bake for 70-80 minutes or until a toothpick comes out the center clean. Let cool in the pan on a wire rack for 30 minutes and then turn out on the rack and turn right side up. Let cool for three hours. Mix together all ingredients for the glaze and pour over the top. Sprinkle with almonds before glaze is dry. I wish I could tell you how long this cake would hold up, however, it has never lasted more than a day around here..it's that good. This cake is dense, rich, buttery, moist...it's everything you want in a pound cake and more. It will be hard for you to make another kind of cake again. And there won't be a reason too. 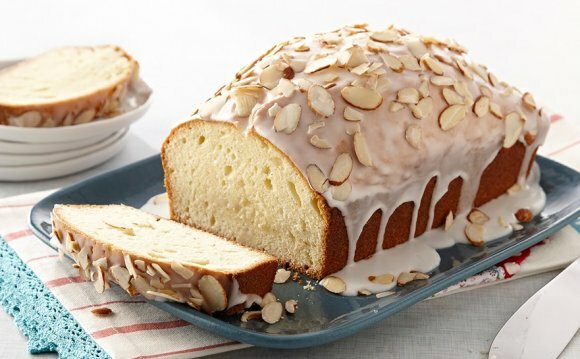 Almond Pound Cake "How To Recipe"